We give you options for how you’d like to deliver proposals to your recipients. 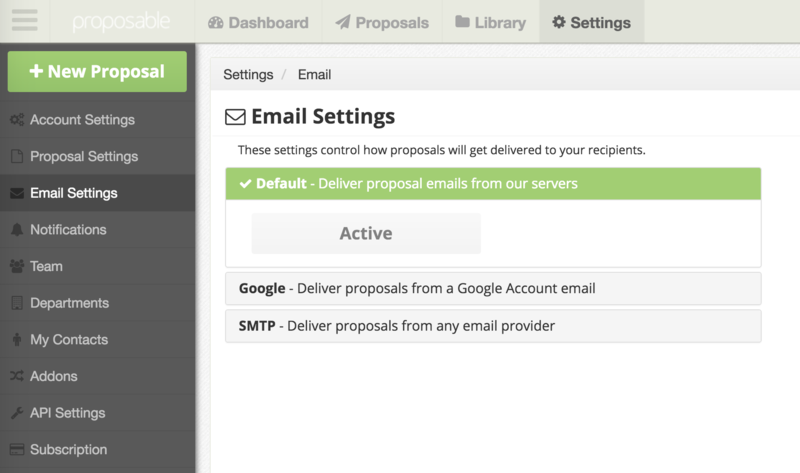 You can use the default Setting, which will send out proposals through our email servers. 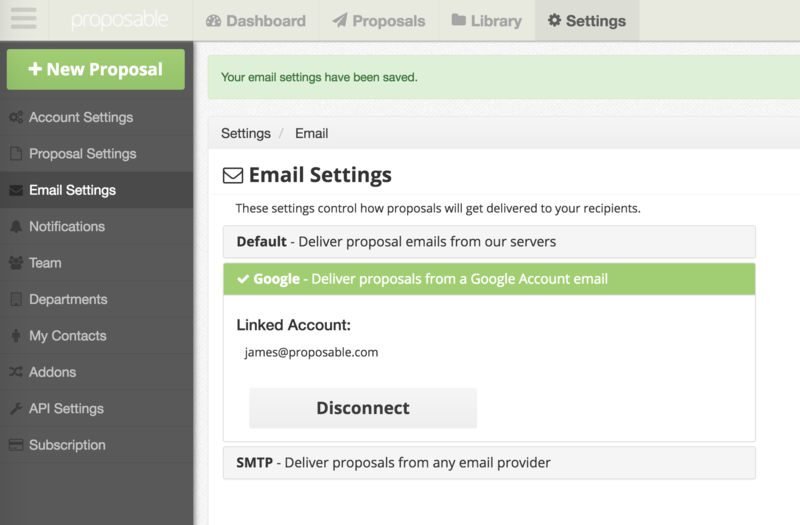 Or, you can connect your own email account which will allow you to send proposals directly from your own email service directly. You can have a complete history of your proposal deliveries in your own email service. Here’s how to connect your own email service for proposal deliveries. Choose from either Google (Gmail) or SMTP (any other provider). For Gmail: Simply click on the Google tab in Email Settings. Next, click on the green Use Google button. This will detect your Google user accounts and it will ask you to choose a Google user account. After you select the email account, you must click the “Allow” button to give us permission to send from that email account. 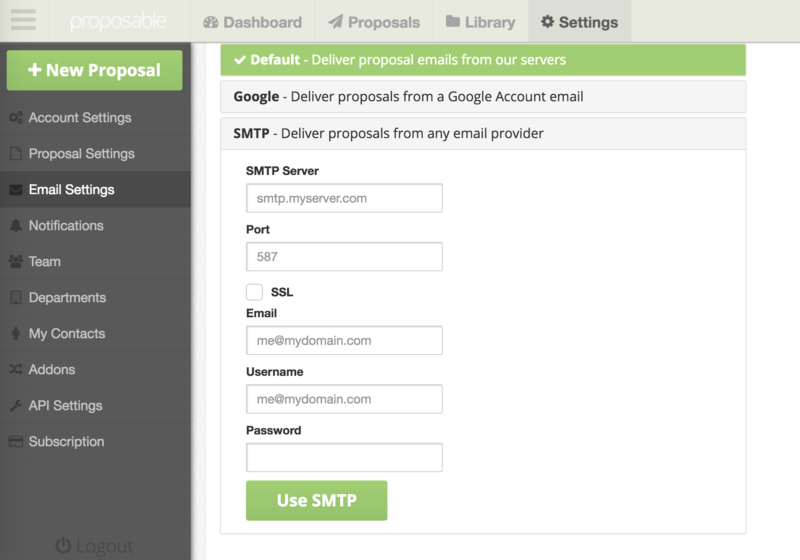 This will connect your Google Mail to Proposable and enable proposal deliveries directly from your own email account. Click on SMTP under Email Settings. Enter the above mention information and click Use SMTP. Once you have set up your account, try sending a proposal to yourself or colleague. Ensure they received the proposal. Also, check your Outgoing mail to ensure the proposal is there. Make sure to enable "SSL" and select "Login" for the "Authentication Type"
If you’re setting up an SMTP connection, be sure to work with your email administrator to obtain the correct login information. It’s a good idea to check if your email provider has sending limits for your account. Some email providers may only allow you to send a limited number of emails per day or per hour. You’ll still reap the benefits of Analytics, Tracking and Notifications. You will now have a paper trail of each delivery email in your own email account’s “sent mail”.